You want to create a Pinterest worthy cake that’ll make your kid the envy of every birthday party attendee. You really do. But fondant? 3 tiered cakes covered with edible glitter that rise from perfectly coiffed beds of grass icing? Sorry, kids. So not your thing. That’s okay. You can still create a genius themed cake for the kid’s next birthday soiree that’ll wow the crowd but won’t keep you up until 2 am the night before running on desperation and tears. These eight birthday cakes use simple techniques and minimal decorating talent to maximum effect. Step aside, Martha Stewart. There’s a new cake boss in town. Throwing a beach bash for your little mermaid? Check out this castle cake concoction from yummy mummy kitchen. Use a couple of different sized round cake pans, stack layers, frost lightly and then sprinkle liberally with crushed graham crackers to mimic sand. You can use upside down ice cream cones for turrets and paper straws and card stock to make pennants. Garnish with real seashells and stand back and admire your beach bucket build. Take a look at this gorgeous array of cake, whipped cream and white chocolate pudding brought to you courtesy of The Kitchen Magpie. Trifles are easy because they simply involve layering ingredients in a big glass dish. The effect is a charmingly pretty variation on cake that is perfect for a rainbow or artist themed party. 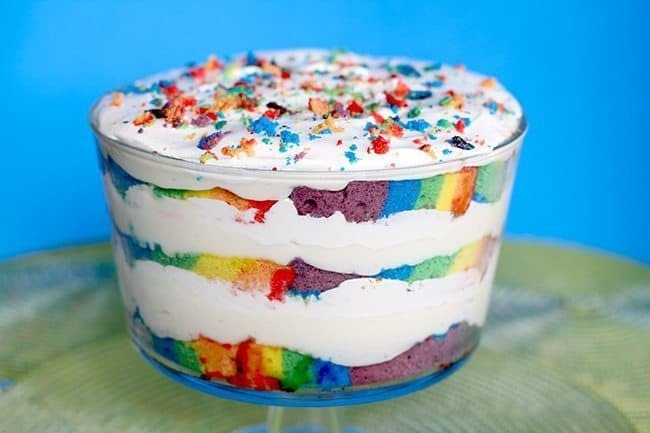 You’ll need a cake recipe or a box mix and some food coloring, but the technique to create the rainbow variations in the cake is impossible to screw up. You’ll get tons of compliments on this treasure at the end of the rainbow. There are many, many versions of this cake from Chickabug and all of them involve the delight of demolition. To construct this heavy duty themed cake, simple bake two layers of your favorite cake recipe, slap them together with some brown frosting, frost lightly, and sprinkle liberally with graham crackers. For extra effect, mix in some roughly chopped dark brown sandwich cookies. Top with plastic dump truck and a variation of round, irregularly chopped candies cascading down the sides of the cake. Creative construction coming through! Looking for something incredible for the candy loving kid? You’ve found it with this Chocolate Box Cake from the Whoot. Simply bake your favorite cake in a 9 x 13 pan, spread with chocolate frosting and let the candy extravaganza begin. You’ll need a plentiful supply of Kit Kats to create the walls of the chocolate box and the dividers, then simply fill in with colorful favorites: M&Ms, Skittles, Oreos – whatever you like. The possibilities are endless. And so is the sugar high. Celebrating a summer birthday? Keep things cool with ice cream cone cakes from passion for savings. These are as simple as they look. Bake a cake of your choice inside store bought cones, frost with piles of fluffy white frosting that mimics whipped cream and top with sprinkles and maraschino cherries. These are so easy you won’t mind when your kids scream for ice cream cakes. Want a Lego themed cake without having to build one? You’ve scored with this version of Lego bricks made out of brownies by In the Playroom. It’s pretty much exactly what it looks like. Bake your favorite brownies in a 9 x 13 pan, cut them into Lego sized bricks, apply frosting in primary colors and top with matching M&Ms. The kids will think everything is awesome when they spy this brick build on the table. Does your little one have a soft spot for ice cream cake? Rather than buy one, consider making your own next birthday by following the instructions for this ice cream sandwich cake over at Just a Pinch. Just stack sandwiches, frost with whipped cream, sprinkle with candy and freeze until the event. It’s a pile of frozen fun that’ll earn you kudos with the kids. Cupcakes are versatile virtuosos of the cake world. If you’re clever enough, you can come up with ways to match any theme. If you’re at a loss, check out the 30 days of cupcakes over at Today’s Parent for help. From rainbows to monsters, clowns to campfires, they’ve got easy ways to execute decorating tips for any cupcake. So gather up your inspiration and head for the kitchen – your canvas awaits!